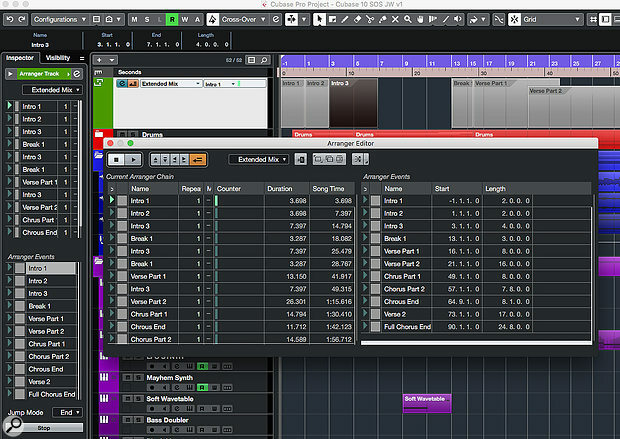 The Arranger Track now allows you to construct multiple Arranger Chains — alternative arrangements of your track — in a single Cubase project. Engineers often need to create alternative mixes of a project. It's common, for example, for a professional engineer to be required to provide a 'vocal up' version of a mix, but there are various reasons any of us might want to create alternative versions of a project — different arrangements that extend or shorten a song, different effects options, or perhaps broadcast-friendly edits to disguise expletives! Whatever the reason, Cubase has a number of tools that can help, and in this article I'll explain how the Arranger Track and Cubase Pro 10's MixConsole Snapshots can help you create alternative mixes and arrangements more easily. Most of what Cubase offers is good, but I'll also discuss workarounds for a few 'cons'. I looked at the Arranger Track (in Pro, Artist and Elements) in SOS July 2010 (https://sosm.ag/cubase-0710), when considering how to create advert-friendly, 30-second cues from a longer project. It basically provides a way to move the playhead to different points in your arrangement on playback, so it can be used for any kind of timeline-based re-sequencing of a song's structure. Having created an Arranger Track (in the same way you create any other kind of track), creating a new arrangement requires just a few simple steps.